When Marcus St. George set about to spend several billion dollars worth of other people’s money to return dinosaurs to the earth, he anticipated their slavering fangs, their bloodied claws and their terrifying shrieks. Their language skills came as something of a surprise, and when they started hanging around his jungle discussing The Simpsons, he knew he was in trouble. It wasn’t until a pair of Tyrannosaurus Rexes began ripping up his theme park demanding more fast food and better DVDs, however, that the full horror of what he’d wrought became apparent. By then, it was a little late. Join a desperate retinue of lawyers, spin doctors and wise-assed reptiles as they flee history’s most unspeakable bad hair day in this biting satire. A hell of a lot of animals were harmed in the making of this adventure. I began this book in 2000, when it was still safe to be politically incorrect and speculate aloud upon inventive ways to dispatch cats. It subsequently bounced around a number of literary agents and publishers, each of whom turned greener than the last as they considered releasing such a work into a world in which ethics czars outnumbered their own brain cells. Inspired by the original Jurassic Park novel — which I will acknowledge having read, albeit during an interminable delay in Manchester Airport — even the various proposed titles of this book were an issue, in that anything which involved the words “Jurassic” and “Park” made someone’s legal department nervous and twitchy. That the author of Jurassic Park later had the profound lack of consideration to die, opening this book up to accusations of unsportsman-like conduct, pretty much buried the project for good. It wasn’t until my more serious books started selling in electronic editions — through Amazon Kindle and its progeny — that it seemed time to call in the archeologists, unearth this hitherto forgotten manuscript and let it outrage a few tenured professors, soccer moms and retired librarians, as it was meant to. Updated for a new millennium in which sneezing with excessive exuberance can result in five-hundred hours of community service, it’s likely to prove objectionable to people scarcely born when it was begun. You’ve got to love books — they can get away with stuff you’d be hung for in more mainstream media. By its nature, satire is wont to be critical of that which it satirizes. 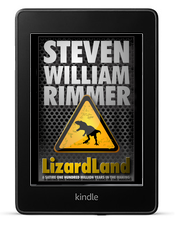 I wouldn’t wish LizardLand to be seen as a broadside fired at all the books and movies involving dinosaurs of late. They were enjoyable diversions, for the most part, doing pretty much what their trailers and voice-overs promised of them. This having been said, if you want to have a stab at pretentious attorneys, untrustworthy businessmen and parents from hell, you could ask for few better spokesmen than a talking dinosaur with an attitude. 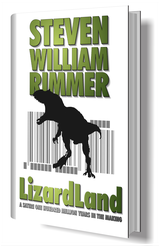 The dinosaur graphic on the cover of LizardLand was derived from Siats Meekerorum by Jorge Gonzalez, 2013, courtesy of naturalsciences.org.